Apple Rumors 2013: What's Coming? There’s a lot on the block for Apple 2013…at least according to the rumor gods. So what can we expect? Here are nine things we expect out of Cupertino in 2013. Retina Macbook Air: Likelihood: 60-70%. Lately, Cupertino has been rapping everything in a retina display, their super-high-definition, high density displays. The full-sized iPad, iPhone, iPod Touch, and Macbook Pro line all have retina displays. Until this year, the retina display was simply too expensive to implement in a cheaper (though not close to cheap) computer like the macbook Air. Now though, with new technology and increased order size, Cupertino can likely get the parts cost down to a price where they can sell such a computer. Expect a delivery date of June, at Apple’s Worldwide Developer Conference at the earliest. Retina iPad Mini: Likelihood: 50%. 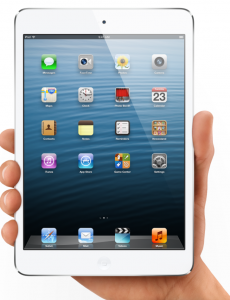 While we’ll definately be seeing a retina iPad mini sometime soon, we can’t be sure it will be this year. Apple’s margins on the current Mini are already to0 low for their liking, so unless they can drastically reduce the price of components, plus Retina displays, it may take an extra year. No guess as to a release date. Retina iMac: Likelihood: 30%. How awesome would that be? A beautifully crisp 27 inch display the thickness of a pencil. The iMac already went through a brilliant overhaul last year, shedding serious bulk, so the challenge is fitting a retina display in without major size changes. Apple doesn’t normally do major computer releases two years in a row for the same line, so any retina iMac isn’t likely until at least mid-2014. Still, it has a chance because of the current proliferation of retina devices (see above. iPhone 5S: Likelihood: 95%. We have no idea what the next iPhone will hold, but based on Apple’s past releases, we can expect it to be called the iPhone 5S, and we can expect it to have an identical exterior design to the iPhone 5, with internal enhancements. It will see the newer, faster dual band Wifi, a new processor, a better camera, and a few other minor features to bring it in line with competitors like Samsung’s Galaxy SIII. Apple TV (actual TV): Likelihood:49%. The late Steve Jobs really wanted to reinvent television, and evidence shows that Apple has been working on such a device, but there’s not enough convincing evidence that they’re ready to roll out such a device this year. This was Apple’s first attempt at a real TV. iWatch: Likelihood: 5%. It was painful for me to give this even a 5% chance. A lot of rumors have stirred around the idea of such a device, but I don’t EVER see Apple developing a watch, and especially without proof-of-concept and longevity by the first wave of smart watches, like the Pebble. Touchscreen Mac: Likelihood: 10%. On the one hand, Steve Jobs denied that Apple would ever make a touchscreen mac, but on the other hand, he said the same thing about tablets before Apple took over the tablet market with the iPad. I don’t see it happening because the iPad pretty much serves that roll, but it isn’t outside of the realm of possibility. Not this year. iMac Pro. Likelihood 55%. Ever since Apple updated every line but the Mac Pro, pro users have been worried as to the future of the Mac Pro, a creative industry standard. Last year, Apple CEO Tim Cook confirmed an entirely new pro product on the way in 2013. Whether this takes the form of a more configurable and High end iMac is unknown, but a Mac Pro in some form is 100%. Stock Dividend. This is a product of Apple in a different form, pleasing a different crowd. Analysts have indicated to me that Apple will likely have a dividend for shareholders this year to spread the benefit of their ridiculous cash flow. And that’s pretty much Apple’s year in 2013. Anything else is a mystery. Let’s compare notes on New Years, and see how we did. Answer this in the comments: What Apple product are you most looking forward to in 2013? Q&A: Why did Apple honour Robin Williams on their site?